Minka Group is a leader in the decorative lighting industry, but as a designer and manufacturer. Their lighting lines are sold under the names Minka-Lavery, Metropolitan, Ambience, The Great Outdoors and George Kovacs. 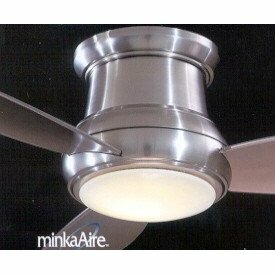 They offer a competitive line of ceiling fans under the name "Minka Aire". 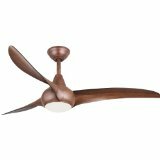 Minka Aire ceiling fans offer some of the most impressive designs available. Like most brands they offer three distinct styles of fans: Traditional, Transitional, and Contemporary. 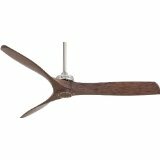 Belcaro Collection - not a ceiling fan, a replica of an ornate Victor Breeze Spreader table/wall floor fan. 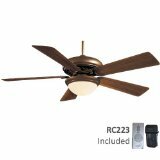 Great Room Collection - an impressively large 72" fan for larger rooms. Corinthian Collection - elegant old-world design with alabaster housing and wrought iron accents. 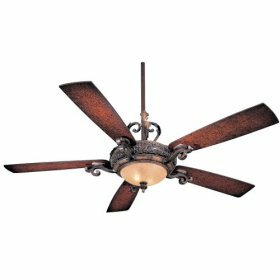 Classique Collection - cast ornate motor design inspired by very early ceiling fans. features. The Concept II is a Hugger fan design.